← Who Are The Good Guys? Does It Matter? In Part 1 of this series, I wrote about public policy in America as it relates to economics. As I said quite clearly in the 1000 words or so, it’s difficult to surmise such a vast topic in such a short space, but I think I made an important connection between altruism and economic policy. While this series is aimed at American Public Policy, the first post in this series on economic policy is relevant to most countries in the G-20. In Part 2, I’ll talk about two things: campaign finance and elections. First, elections. The Federal Elections Commission (FEC) has been in the news recently and likely will be for the next couple of days after an FEC official told a New York Times reporter, “Maybe we should not be so trusting,” (after having learned that something they [FEC] were told may not have been true). The FEC will also, undoubtedly be in the news anytime anyone decides to create a Super PAC. For anyone that enjoys political satirist Stephen Colbert, you’ll know that he has spoken at length about his trials and tribulations to create a PAC and (then a Super PAC) on his show. While what he is doing is initially intended as humor, there is also a very serious streak to it. Earlier last year, the Supreme Court heard and ruled on what is a rather famous case, Citizens United v. Federal Elections Commission. There are so many different interpretations of what this means for elections in the US. Keith Olbermann had a rather heated point of view. Rachel Maddow was a little less dramatic in her delivery, but she shares a similar viewpoint to Olbermann. Much of what you’ll find on YouTube are videos not in favor of this decision, but I was able to find one video from Congressman Dan Lungren of California applauding the decision. I like the use of animation and moving picture, so another good video to check out is the one by Annie Leonard. When I first made a point of wanting to write a post about campaign finance, my initial thoughts were to have candidates donate all of the money they receive. Maybe that’s too idealistic? Really though, shouldn’t it be that money plays little to no role in who is elected? I understand how difficult it would be to sell Barack Obama on donating 1 billion of his campaign contributions to charity, or whomever the Republican candidate happens to be to do the same. I think that elections should be easier. I think the problem that elections have become so “difficult” is that the citizens doing the electing don’t trust their elected officials. While we could bring in any number of psychological theories to help us understand, I think the bottom line is there should be an inherent honor (in the elected official) and, maybe, a covenant between elected officials and citizens. Many people will see this decision as a decision they should fight because they think corporations should be silenced. I don’t think the point here is that corporations should be silenced. I think the point is we need a political system where people can trust that the decisions Congress makes are decisions based on the merits; on what makes sense or what the people in their district want and not what the funders demand. This decision will only exacerbate the current problems with the system. And the way we should respond is by pushing for an alternative that gets us a system for funding elections that doesn’t lead people to wonder whether it’s money rather than sense that is producing a political result. Elections can be a fickle thing, not just in the US, but around the world. I would think in a society that is so developed, elections fraud would not be something so rampant through its politics, but that seems not to be the case. A search for United States Elections Controversy on Google returns nearly 10,000,000 hits. One interesting article I found was one author’s view of the most significant Presidential Elections in history (in the US). As I furthered my search, it wasn’t difficult to start turning up articles about controversy in US elections. In fact, there’s more than I can really talk about in the bit of space remaining for this post. There’s one about a gubernatorial election in Alabama in 2002, one about controversies in the 2004 election, and who could forget the infamous Florida recount? In case you did forget, there was even a movie made about it. For anyone who follows Wisconsin politics, there’s the history of errors by Waukesha County clerk, Kathy Nickolaus, including this year’s. I don’t work in elections, so I don’t know how hard it is to organize these kinds of events, but I would think someone who has made so many errors that have been made public would probably not be hired (nor should she apply?) for jobs that require such finite detail. 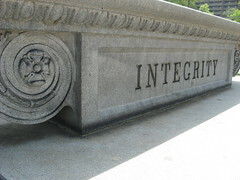 Anyway, the more I read about elections in America (and the world), the more I wonder about integrity. I would expect that people involved in creating these laws and upholding these laws would operate with a sense of high moral integrity. Wouldn’t you? These people are being put in some of the more important (but undervalued) positions a country can have, and it seems that they just don’t see it that way. Maybe they do, but it’s not showing. 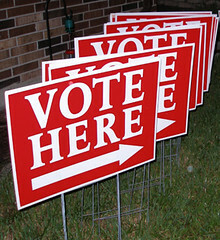 Campaign finance and elections needn’t be dirty words. The people who create laws around these issues shouldn’t look for (or intentionally leave open) loopholes. In an upcoming post, I’ll talk about how inequality within a nation is bad for everyone in the nation (including the rich). This entry was posted in Politics and tagged Campaign, Controversy, Election, Integrity, Law, Public Policy. Bookmark the permalink. Ever take a look at "Follow the Money"? It's a great website where you can track political donations for a variety of candidates. I highly recommend it! Thanks for your comment. Yeah, I've checked out this site since you offered it on this post. It's very interesting to see where some politicians get their funding. It can be quite illuminating with regard to what some politicians support (or oppose) in the context of their funding.